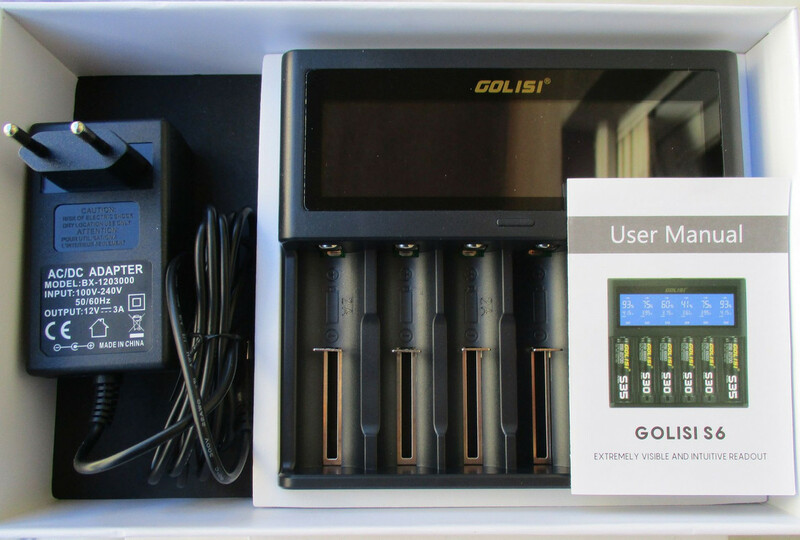 Golisi founded in 2017 and based out of China, manufactures and supplies Li-on batteries, and smart battery chargers around the world. Adding vision and value through high standards of quality control, Golisi chargers have achieved all major certifications, such as CE, ROHS, EMC and FCC. 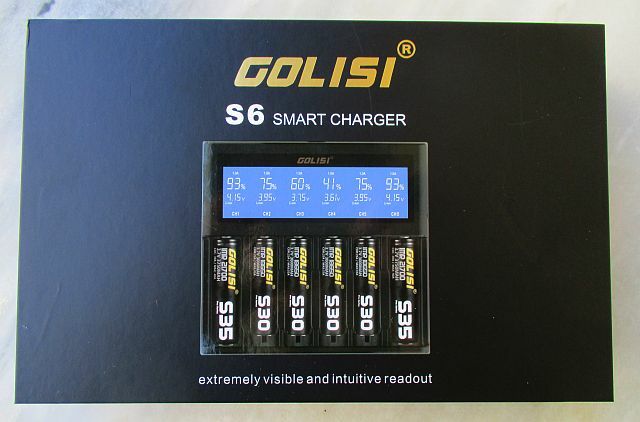 Today I will be looking at the S6 Intelligent Charger, a 6 bay battery charger that it was sent to me by Golisi for the purpose of this review. In the package besides the charger there’s a standard UL certified power adapter and a user manual. The Golisi S6 is nicely built and it doesn’t feel flimsy or cheap. It’s made out of fire proof ABS/PC plastic and the military grade springs are smooth but sufficiently strong. Loading and unloading the batteries is very easy due to its spacious slots. Starting from the display, the HD LCD screen of the S6 is surprisingly clear and sharp. An aesthetically pleasing blue color is the first thing you’ll notice when the charger is on. The other indications are the channel number, the type of the battery, the percentage and the charging current. The screen turns off after a minute, but you can have it always on by holding the button of the device down for three seconds. This is pretty much the user interface of the charger. 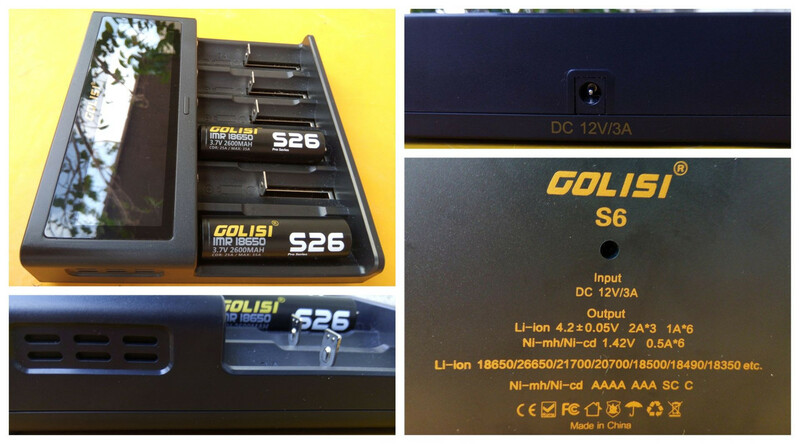 The Golisi S6 Smart Charger is able to charge three Li-on batteries at 2A simultaneously in the 1st, 3rd and 6th slot. Practically this means that it’ll charge them fast. If you put in four or more Li-on batteries, it’ll charge them all at 1A. It’ll house six 21700 batteries and charge them at 1A simultaneously. The battery compatibility. It’ll charge almost every cylindrical battery you throw at it. The screen. An excellent contrast between blue and white, makes it easy to read even from some distance. It doesn’t get hot while charging. It’ll get slightly warm at full speed (6X1A) but it won’t overheat. The first time I used it I thought it was defective since all of my chargers are quite noisy. The S6 is totally noiseless. When I’m not in a hurry I like to charge batteries at .5A. It gives them longer run time on a charge and increases overall lifespan of the cell. There’s no option for lower charging current than 1A for Li-on cells and I’d like Golisi to add that feature in a future version. A discharge mode to determine the true capacity of a cell. The Golisi S6 is a charger made with vapers in mind. It works well, it’s fast and it’s easy to use. If you’re in the market for an upgrade, it won’t disappoint you. Price wise, it’s on the expensive side but I except it’ll sell for a little less when it hit the shelves. Categories: Vape Gear News | Tags: Golisi S6 Intelligent Charger review | Permalink.